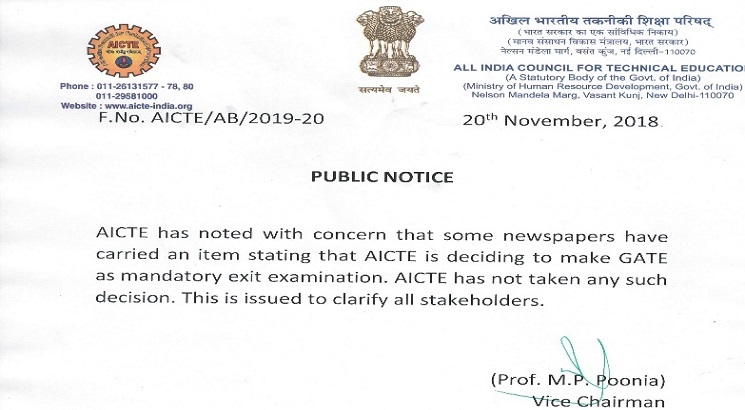 NEW DELHI, NOVEMBER 22: The All India Council for Technical Education (AICTE) has issued a public notice denying making the Graduate Aptitude Test in Engineering (GATE) being made ‘mandatory’ exit examination for acquiring B.Tech/B.E. degree. The apex technical education regulatory body has denied taking any such decision as being reported by some sections of media. Earlier, the Higher Education Secretary R. Subrahmanyam had also clarified that the news published that ‘GATE exam is being made compulsory for all engineering students’ is ‘incorrect’. GATE is a national level entrance exam conducted by the IITs for all the students wishing to pursue M.Tech in IITs, NITs, GFTIs and major universities across the country. A number of Public Sector Units recruit candidates on the basis of their GATE scores.